Little known fact: Before Google landed on "Don't be evil" as their corporate motto, they almost chose "Bovine privacy is job no. 1." While that's a bald-faced lie, it would go a long way to explaining why Google took the effort to protect the identity of a British cow. 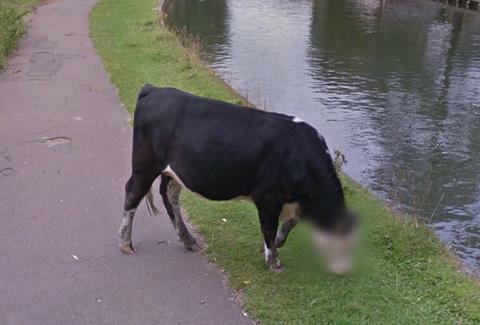 Found on Google Street View by an editor at the Guardian, Google was capturing images along the banks of the River Cam, in Cambridge, England when a cow crossed the road. It sounds like the start of a joke, but it's actually just the start of a computer error. Google's software is set up to automatically blur out faces and license plates when taking pictures for Google Street View. This bovine grazer was misidentified as a human and blurred out. It's served to re-stir some debate about Google's privacy practices. Many say their facial recognition doesn't go far enough and that blurred out faces and license plates can easily be revealed, as was recently by researchers at the University of Texas at Austin and Cornell Tech. "We thought you were pulling the udder one when we herd the moos, but it's clear that our automatic face-blurring technology has been a little overzealous. Google may be cracking up at their lame puns, but that cow's family is seriously concerned about their privacy. If you back up from the position where the cow's face is blurred, the face is no longer blurred and its identity is revealed. It's a scandal and the cow's family has issued a mooving statement asking the press respect their need for privacy at this time.